Need A Custom Air Compressor System? Suited Just For Your Business. A&W Compressor & Mechanical Services, Inc. is proud to offer comprehensive air compressor sales and service in Knoxville and throughout Tennessee. Whether you’re in need of air compressor maintenance services, replacement parts, or emergency repair services, or looking for a new or used air compressor for sale or air compressor rentals for short-term projects, we’ve got you covered. Since 1982, our company has been providing reliable and efficient service with honesty and integrity in taking care of a variety of air compressor needs for businesses throughout the state. At A&W Compressor, we are experts in all types of compressed air systems and focus on providing only the highest quality products and unrivaled service to our customers. When it comes to offering air compressor maintenance and repairs, we believe our work speaks for itself. To demonstrate our penchant for consistently delivering only the highest quality workmanship, we never lock our customers into a long-term contract like other companies do. In fact, our customers can cancel service at any time without penalty. We offer this opportunity because we know that over time our customers will see the true value of the service we afford. We understand that if your business relies on a functioning compressed air system to maximize productivity, you need experienced professionals to ensure the equipment continues to operate at the highest level. We also know that breakdowns can occur unexpectedly, which is why we are available 24/7 to respond to emergency situations with the air compressor parts and repair services you need. Our air compressor maintenance package also provides preventative monitoring and control to keep your system running efficiently and help identify problems before they result in costly downtime. If you’re starting a new project or your equipment has run its course, A&W Compressor also sells and rents new and used compressors. 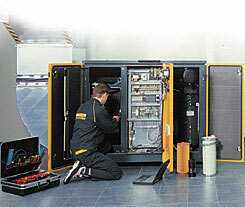 As an authorized distributor of Atlas Copco products in Knoxville and other parts of Tennessee, we are able to provide compressed air equipment that features the most innovative and energy-saving designs. If you’re not sure which type and size compressor you need, no worries. We can perform an air audit to help determine what equipment and level of output you need to meet the air quality and dew point requirements of your industry or product. We have systems ideal for a wide range of industries, including automotive, food, commercial, municipal, government, hospitals, water and power companies, and many more. At A&W Compressor, we have a large inventory of new and used air compressor equipment available for sale and rent for businesses located in and around Knoxville, Tennessee. 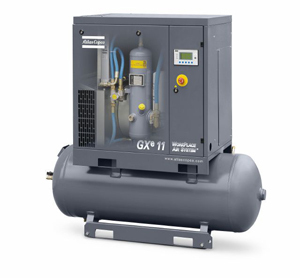 This includes both Atlas Copco’s popular oil-injected rotary screw compressor with variable speed drive (VSD) that provides exceptional energy efficiency and oil-free air compressors for industries in which air quality is of the utmost importance. Additionally, we offer all related equipment, including air dryers, air and gas treatment products, vacuum compressors, and much more. We can even provide a comprehensive assortment of parts for air compressors and related equipment or maintenance and repair service packages to help ensure these systems continue to operate properly. If you’re in need of air compressor parts, new or used air compressors, or air compressor maintenance and repair services in Knoxville, TN, the only name you need to know is A&W Compressor. Contact us today for more information.